As summer wanes and the autumn leaves turn hues of bright red and orange, we instinctively turn to warm comforting foods like curry. Not a single spice, curries encompass a broad range of spices unique to the geographic locale across many different countries and ethnicities. 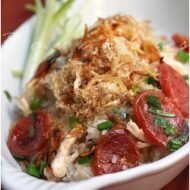 Aromatics such as galangal, lemongrass, kaffir lime leaves, and chili are pounded and mixed with dried spices, layering complex flavors upon flavors. Typically, curries are composed of a protein, poultry, beef, or seafood along with vegetables in a thick, gravy like sauce. 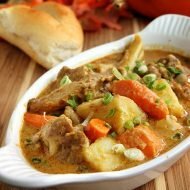 In Vietnam, curry is call ca ri, and the most common preparation is a rich and hearty chicken stew, called ca ri ga. Chunks of potato, carrots, onions are added and the meal is completed with toasted baguette or simply ladled over a steaming bowl of jasmine rice. 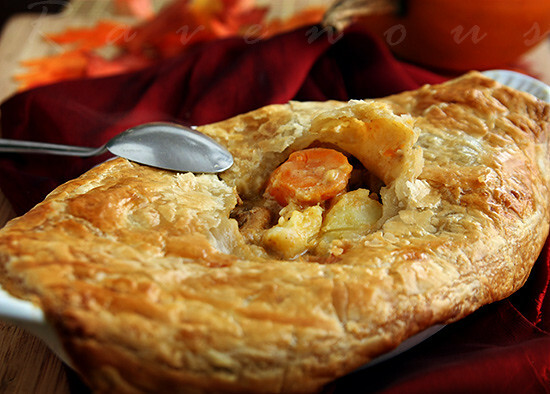 However, one variation that we’re particularly fond of is ca ri ga pot pie using puff pastry. 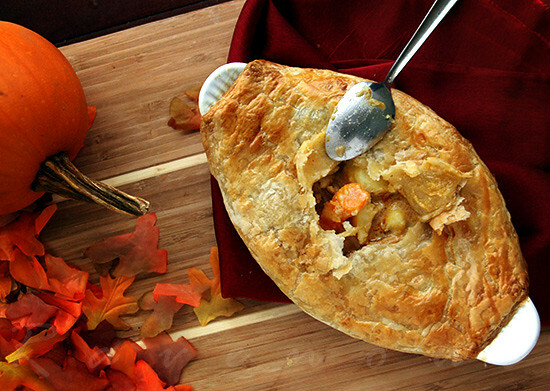 Take our favorite part of a pot pie (the crust) and add it to intensely fragrant curry. We don’t care if you call it fusion, it’s just mighty damn good! 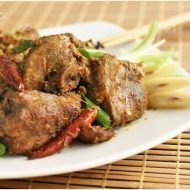 There are many varieties of curries and for a more in depth discussion, read about curries with this excellent article. We prefer using Mae Ploy brand Massaman curry paste for this dish, because it contains a wider array of spices as well as a hint of cinnamon. But feel free to experiment! This brand is great because it comes in a resealable jar and keeps for months in the fridge. If you want to make the ca ri ga pot pie, preheat oven to 400 degrees 15 minutes before the ca ri is done and remove the cut puff pastry from freezer and allow to defrost. Make a egg wash with 1 egg and 1 tbs water and generously brush the edges. Ladle the ca ri into an oven proof ceramic cookware and place the puff pastry, egg wash side down over the container. Seal by pressing pastry edges tightly onto the cookware. Brush another layer of egg was on top of the puff pastry and make a small “x” in the center to dissapate steam. Bake until crust is golden and flaky, about 15 minutes. If you’re making the pot pie from leftovers in the fridge, microwave about 1-2 minutes before baking to ensure even temperature. Although always reluctant to see summer disappear, we quickly forget and are easily comforted by warm and soulful curries. It really should be illegal to crack into a perfectly crisp puff pastry crust and discover the rich and hearty flavors of ca ri hiding inside. But go ahead, treat yourself and your family and whip up ca ri ga pot pie. They’ll warmly thank you for it. First marinate the cut pieces of chicken with shallots, garlic, minced lemongrass, salt, pepper, and 2 tbs of curry. Make sure curry paste coats the chicken evenly. Allow to marinate about 1/2 hr covered in fridge. In the meantime, prepare the potatoes, carrots, and onion. If you're going to make the pot pie, allow to thaw slightly at room temperature. Place your container on top of puff pastry and cut around the container with a pizza cutter leaving about 1 inch margin. Return the puff pastry back to the freezer until ready for use. In a large pot on medium heat, add about 1 tbs cooking oil and sautee the chicken along with an additional 2 tbs of curry paste. When the outside of the chicken is browned, roughly 3-5 minutes, add coconut milk. Stir and meld together for another minute and then add chicken stock and the remaining stalk of lemongrass. Then add the vegetables according to how quick they cook. We add carrots first, potatoes about 3 minutes later, and finally onions just when it's about to boil. Bring to boil and reduce to low heat and simmer until vegetables are just soft but not too mushy. Season with salt or fish sauce and sugar to taste. Garnish with thinly chopped green onion. For pot pie, preheat oven to 400 degrees 15 minutes before the ca ri is done and remove the cut puff pastry from freezer and allow to defrost. Make a egg wash with 1 egg and 1 tbs water and generously brush the edges. Ladle the ca ri into an oven proof ceramic cookware and place the puff pastry, egg wash side down over the container. 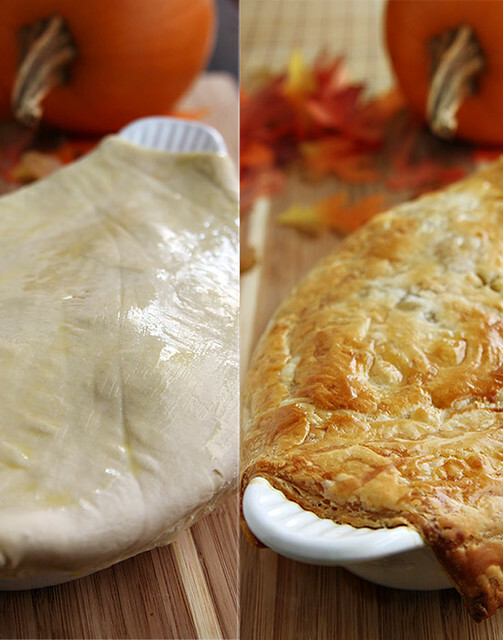 Seal by pressing pastry edges tightly onto the cookware. Brush another layer of egg was on top of the puff pastry and make a small "x" in the center to dissapate steam. Bake until crust is golden and flaky, about 15 minutes. Quite an ingenious use of puff pastry on Chicken Curry. Will definitely give it a try soon, especially now that the whether has turned cooler. Have to tell you, I made the Durian Semi Freddo Pie last weekend for my father-in-law's birthday party and it was a smashing hit! I did double the pastry recipe (but kept the sugar amount the same) to give the tart a more heft, but all in all, the in-laws LOVED it, and that says A LOT because everyone in that family are foodies/self-proclaimed chefs. Thank you for ingratiating me to the in-laws! Great curry photos. I like the idea of curry pot pie and will definitely try it. I did a chicken curry and then wrap with bread dough and baked it and it was good. In Singapore and Malaysia they call it Golden Pillow. Cheers. Oh my gosh, you are a genius! I make Vietnamese curry all the time, but have never made it as a pot pie. That looks SO good… I'm definitely going to be trying that out this winter! tt: that's fantastic!! we didn't think anyone would be brave enough to try that durian semifreddo! Kudo's to you! ramenikia: golden pillow sounds fantastic! allison: so glad you found us..let us know how it goes! what a great idea! i make vietnamese curry all the time-never thought to turn it into a pot pie!! will definitely have to try that soon! I've been making a lot of curries too. Great idea turning it into a pot pie! Very creative to have added the puff pastry crust! 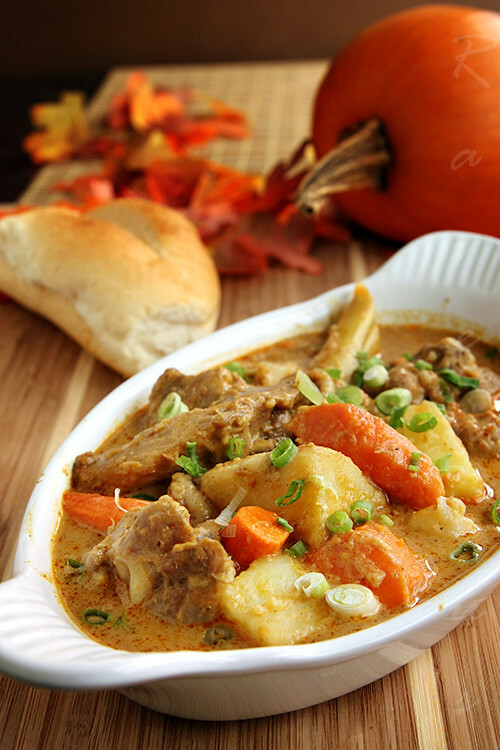 This looks like a nice chunky dish that is perfect for the colder fall season. This looks awesome. I love Vietnamese curry, and I love the curry puffs I used to get at the Vietnamese bakeries. Total genius! Yum, I love a good chicken dinner recipe. I just made a chicken casserole the other day. It's called Artichoke Olive Chicken Bake. I loved it! I'm going to put your recipe on my "To-Make" list, too! I made this last night, and it was delicious! Thank you for sharing the recipe. Hello! You guys had me at cari ga, and the addition of puff pastry makes it even more irresistable! i've always loved the idea of ca ri ga pot pie, ever since i saw Wandering Chopstick's version a few years ago. this is the perfect dish to tuck into as the weather gets cooler. What a tremendous sounding recipe, I love the combination with the puff pasty. I was so happy to meet the two of you at the Foodbuzz festival. Look forward to doing so in the future. This is a very pretty idea! I am going to try this one. Really looks so delicious. Excellent! …Ca ri ga, one of my favorite dishes–served with a fresh French baguette! …I wonder how it would be with fresh wild pheasant! You know, I don't think I've had Vietnamese Ca Ri Ga before. This looks good, fusion or not. Yumm, I am going to try this recipe this week. I would like to make it spicier, can I add some thai chili pepper or pepper flakes? Tanks for the recipe!! Hi guys! I made this last night for dinner and it was super yummy!!! Do you have a cookbook? If not, please make one as I live to cook your food and I keep having to come back to print out your recipes!!! Hi Tammy, thank you so much for the feedback. we love hearing how it goes. no, we don’t but thanks for inquiring! Join us on FB and post your photos of what you make there. Wow. This is AMAZING. I wasn’t sure, since I’m really picky about chicken, but the chicken was tender, the veggies were flavorful and the sauce was fabulous. I didn’t have puff pastry, so instead used pie crust and it was still great. Definitely a repeat recipe. 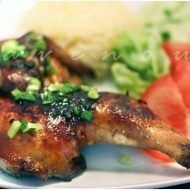 I was wondering if I would be able to use plain chicken breasts!? Thank you for the recipe. Made this for the first time for dinner guests last night and everyone loved it. Will try with puff pastry soon. it’s ok to leave out..it’s more a ragu that way. but if u want to experiment, you can try soy milk? Just discovered this site! Your recipes have been fantastic! I’ve made the beef stew, pork belly and shrimp and will be making the curry tonight! Do you guys have a cookbook? no, its too much work. but so glad to hear! Yummy, this is one of my all time favorites…Thanks for sharing this recipe. I love your site & the authenticity of the recipes on your blog. If you both ever published a cookbook, I’d be sure to buy it. This recipe for Ca Ri Ga, however, is way too salty for me & I usually like eating things more salty than most. I’d probably omit the salt when marinating the chicken or reduce the amount of curry paste next time. I think the paste was the culprit here. I added the lumps of paste that was part of the marinade into the pot when I went to cook it. Maybe including in the directions to discard any extra marinade would be good? I had to add more coconut milk & water to really get it back to edible.